As with many things, preparation is key when it comes to DIY – and especially when it comes to wallpapering. There’s nothing more irritating that having hung perfectly lined up wallpaper only to see bumps, bubbles or pits appear because on uneven plastering. Below we take a look at lining paper and how it can help you achieve better results when you wallpaper your home. Think of lining paper as wallpaper that’s specifically designed to be applied to bare walls to prepare them for wallpapering. It is made from strong fibres so it’s typically more robust that outward facing wallpaper. This means it forms a flat layer over any imperfections in the wall. If you like to feel like you’re doing your bit for the environment, you can get lining paper that’s made from eco friendly fibres. These are typically the heaviest lining paper grades. Whatever type of lining paper you buy, there are always advantages over not using any at all. The primary reason people buy lining paper is to smooth the walls of the room you are redecorating. The lining paper will disguise small bumps, pits or cracks – the more imperfections there are, the thicker lining paper you should use. Another big advantage is that it stops the wallpaper from shrinking. This is a common problem when wallpaper is applied directly to walls. It will expand as moisture is added to it in the form of wallpaper paste, then shrink again as it dries. This will lead to gaps between the wallpaper. Lining paper will hold the wallpaper in place at its expanded size. Thirdly, lining paper will stop hung wallpaper from peeling back. This is more common when cheaper wallpaper and adhesives have been used. 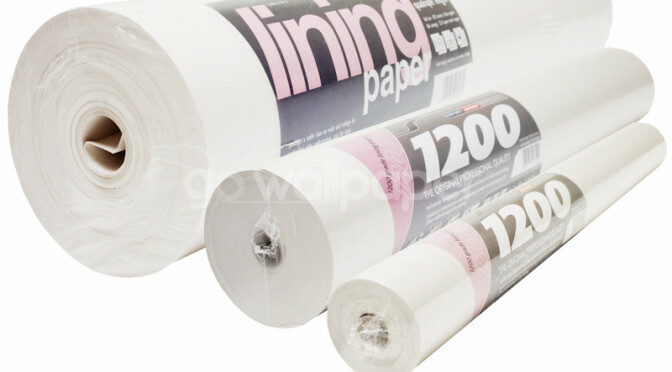 These are the main points, but there are other added benefits to using lining paper such as added insulation. So now you know how many advantages there are to using lining paper, you’ve got no excuse not to use it next time you redecorate!